I almost feel guilty calling these muffins. None the less, they are a quick bread so they are muffins…but extremely yummy cake-like muffins. Center a rack in the oven and preheat the oven to 350 degrees F. Line or spray the 12 cups of a regular-size muffin pan or 6 jumbo cups. Melt the butter and half the chopped chocolate together in a bowl over a saucepan of simmering water. Remove from the heat. In a large bowl, whisk together the flour, sugar, cocoa, baking powder, baking soda and salt. In a large glass measuring cup or another bowl, whisk the buttermilk, egg and vanilla extract together until well combined. Pour the liquid ingredients and the melted butter and chocolate over the dry ingredients and, with the whisk or a rubber spatula, gently but quickly stir to blend. Do not overmix the batter. Stir in the remaining semisweet chocolate. Divide the batter evenly among the muffin cups. Bake for about 20 minutes, or until a thin knife inserted into the center of the muffins comes out clean. Transfer the pan to a rack and cool for 5 minutes before carefully removing each muffin. In a large measuring cup or bowl whisk together the eggs, milk and vanilla extract. In another large bowl whisk together the flour, sugars, baking powder and salt. Stir in the chocolate chips. With a spatula fold the wet ingredients, along with the melted butter into the dry ingredients and stir only until the ingredients are combined. Do not over mix the batter or tough muffins will result. Fill muffin cups with batter. In a small bowl combine the 1 Tablespoon sugar and 1/2 teaspoon ground cinnamon, sprinkle over each muffin. Place in oven and bake until toothpick inserted in the center of a muffin comes out clean, about 18-20 minutes. 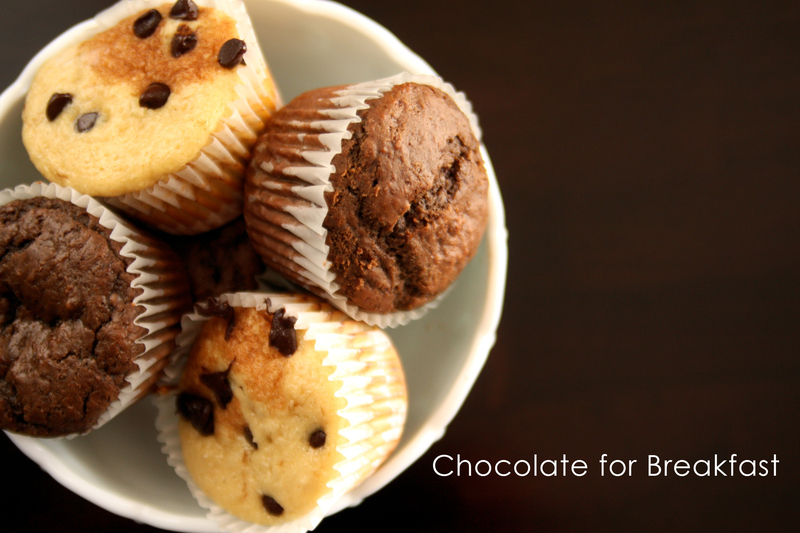 This entry was posted in Muffins and tagged chocolate, muffins. Bookmark the permalink.